I spent today reading, drawing and ‘chain drinking’ coffee. The changeable weather outside gave me the excuse to settle into the flat I am staying in and get into the rhythm of the project. I began by doing some quick sketches and a simple drawing for the first addition to the Selkie cloak. I decided to depict the leaping fish which had sparked my musings yesterday and was pleased when I spotted a few more leaping fish as I drew. 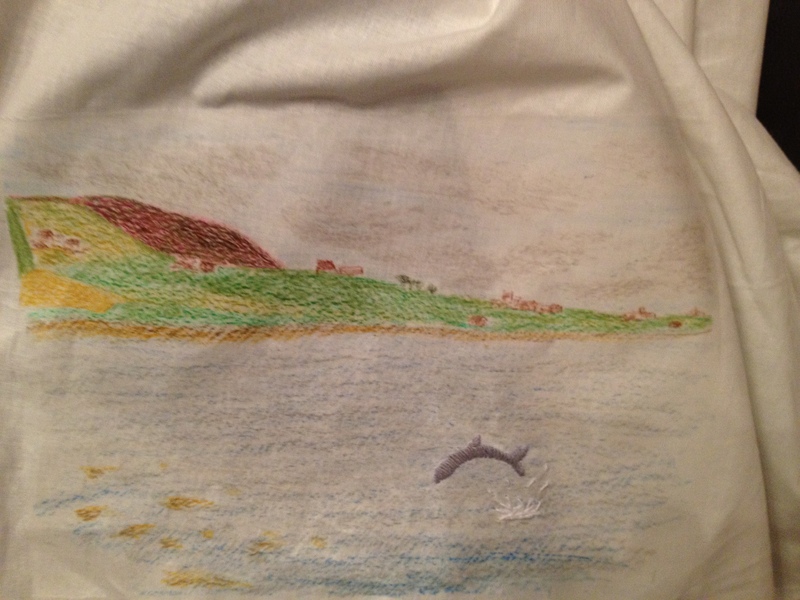 As I completed embroidering the detail of the fish over the drawing I glanced up to see the bay had suddenly clouded over. The wind was howling around the building and the surface of the water danced as gusts blew across it; creating darting ripples between the patches of floating seaweed. The rain began to drum down on the skylight and I watched through the window as gulls struggled against the blustering weather. It occurred to me that the window which had allowed me to quietly observe the behaviours of the birds and fish was now a barrier to a different bodily connection to the land. Although I could see and hear the storm billowing around me there was something fundamental missing from my experience. I promptly left my flat; barefooted and jacketless I stepped out into the storm. Instantly the wind and rain hit me. Drenched in seconds, my hair whipped across my face and the cold rough tarmac under my feet sent a shiver through me. I walked around to the side of the building and leaned over the low wall to get a closer look at the water. Below me the rain splashed into the sea, each heavy drop rejoining the immense body from which it had once been a part and above me the buffeting wind drove the dark clouds out over the landscape. As quickly as it had arrived the storm moved on across the water leaving me soaked, clothes sticking to my shivering flesh and rain water dripping down my face. The damp, salty air smelled fresh as I breathed deeply. It was only then that I noticed the couple in a car waiting out the shower and watching me with bemused interest. I smiled at them as I realised how odd I must have looked rushing barefoot from the lodge. When I returned inside and had changed into dry clothes I pondered over how uninhabited I felt in this unfamiliar environment away from my usual routine.